Different spellings for the same index term making you crazy? DocuWare’s Index Cleaner helps clean up all your entries that might have different spellings accumulating in your file cabinet over the years. This is an enormously handy tool that will help keep your filing system in perfect order. The easiest way to start Index Cleaner is to enter “DocuWare Index Cleaner” into the Windows search field and click on the name in the result list. If you haven‘t yet installed Index Cleaner, right-click on the DocuWare Desktop Apps icon in the Windows taskbar, and then click Install DocuWare Desktop Apps. The Client Setup opens, where you select the Index Cleaner under the administrative applications and run the installation. Select the file cabinet and specific index field that needs cleaning. • Identify words that need to be excluded from the check, in the list of ignored words. Index Cleaner helps you to find words in the index entries that might be useful as ignored words. • Exclude special characters from the scan. • You can also compare the index entries with entries from an external list. Index Cleaner includes the entries of the external list in the creation of word groups. This allows you to use these entries for corrections and, for example, to ensure that customer names from your CRM are also used correctly in the file cabinet. • With the first, you can notice typographical errors or inconsistent spellings in the index entries. • With the second, you will notice different word sequences in the index entries. Index Cleaner determines entries that contain the same words but are in a different order in the index entries, for example ‘Thomas Rain’ and ‘Rain, Thomas’. The following steps are required after each scan, regardless of the type of scan you have selected. If you want to perform both checks for an index field, you must edit the respective word groups and start a correction run both times. As a result of the check, Index Cleaner provides you with a list of word groups with similar index entries. From these word groups, you search out index entries to be corrected in the archive and determine which terms are to be used instead. Then you can start correcting! Index Cleaner will only change the index entries that you have set up for correction. If the list of word groups is very extensive, you have the option to work in partial steps. In this case, edit the word groups successively and start a correction run after each processing of a subarea. 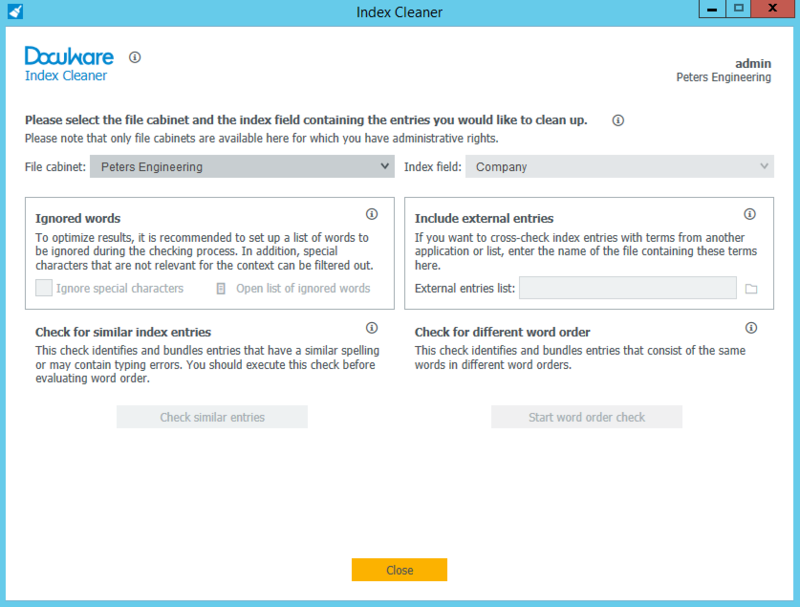 Index Cleaner is currently only available with an on-premises system. For more information, see the DocuWare Knowledge Center. DocTech have the experience and knowledge to help you with your document management solution – call the team today on 0161 667 3390 or email sales@doctech.co.uk.